SUMMARY: Perhaps more than any other marketing tactic, search engine optimization changes very quickly. 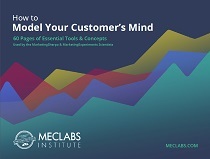 After all, marketers are at the whims of decisions by very few, and depending on who you ask, only one company. So, the market can sometimes whipsaw based on a single decision. To understand how marketers manage this evolving tactic, we asked a very simple question for this MarketingSherpa Chart of the Week. Panda Dance. Caffeine. Smoked Turkey. Payday Loan. Florida. Panda/Farmer. If you instantly know which of the above was not a search engine algorithm update, then the below chart may have little interest to you. Q: How does your organization manage and execute its SEO campaigns? 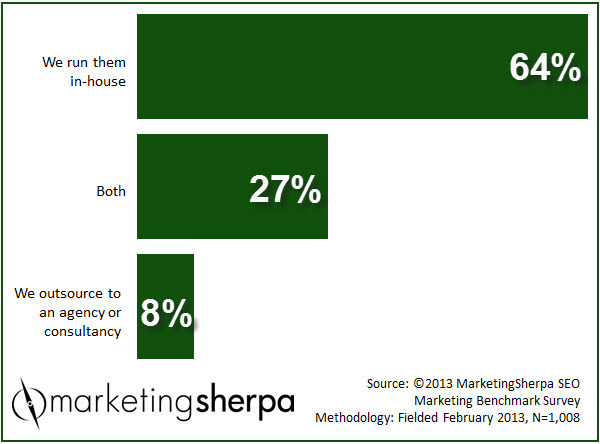 Nearly two-thirds of marketers handle all search engine optimization in-house. On the one hand, it can make sense to handle SEO in-house since search engine optimization isn't really just one thing — ranging from basics like getting indexed to advanced business functions like creating content valuable enough to an industry or target market that it will attract inbound links. Modern SEO is essentially like an octopus, reaching its tentacles into many diverse areas of a business, which makes a case for having the knowledge of the business, and even the org chart, that perhaps only an actual employee can. Plus, SEO has become a more mature tactic. As SEO has grown in maturity, there are more potential skilled workers in the job market for companies to hire. A recent search on Indeed.com resulted in 8,416 job openings that include the keyword "SEO" — everything from specific roles, like organic search analyst, to job descriptions that require SEO as one of many tasks, like Web marketing coordinator. However, how do marketers handle SEO in-house? One respondent, whose title was listed as inbound and data science, replied, "Built a new team. Team is autonomous and complementary to other parts of the business. Advises business like an internal consultancy." So, even some in-house marketers see the need to keep the SEO function somewhat independent — and focused. This is especially important given the rapid changes that affect search engine optimization. While changes in email marketing or print advertising will likely have an only incremental effect on company performance in the short term, I've heard one marketer lament after a search engine algorithm update, "It's like I had a shop on Main Street dependent on foot traffic, and then, overnight, the city came and ripped up Main Street and moved it three blocks over." Perhaps due to the need to stay on top of these rapidly changing factors that influence SEO, 35% of marketers had some agency or consultancy relationship to help them with their efforts. Although, it should be noted, just 8% outsourced all SEO functions, reiterating the importance SEO holds for many modern businesses and the need many marketing departments see to be involved at some level. "We are currently, for the first time, going through the process of hiring an agency for an audit and competitive analysis and then potentially for ongoing monthly consultancy — hiring an agency to audit our current site and provide us with benchmarks on which to build our strategy for the new year."